"Documentado/Undocumented," a work-in-progress with Guillermo Gomez-Peña and UCSC faculty Jennifer Gonzålez, Gustavo Vazquez, and Zachary Watkins. 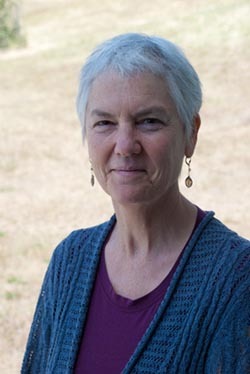 Alumna Felicia Rice (Cowell '78)—now manager for UCSC’s Digital Arts and New Media M.F.A. program (DANM)—will be featured in The Art of the Book in California: Five Contemporary Presses, an exhibition running June 1 through August 28, at Stanford’s Cantor Arts Center. A lifelong resident of the California coast, Rice came to Santa Cruz as a student at UCSC in 1974. Three years later, she established Moving Parts Press and began her career as a printer, teacher, literary/fine arts publisher, and book artist. 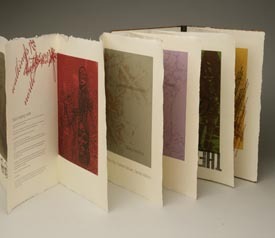 “It is a high honor to be selected for this exhibit—one of five California presses—when there are so many active book artists in the state,” said Rice. “As e-books become more and more popular, these works represent one view of what the future holds for the book form,” she added. Rice’s Moving Parts Press has been included in exhibitions and collections both nationally and internationally—from book shows in New York and Frankfurt to the Victoria & Albert Museum. "During the last 50 years, the conception and production of the book has evolved into an art form that exceeds all former standards,” noted Roberto G. Trujillo, head of Stanford Library's Department of Special Collections, which is lending works for the exhibition. “Book arts have become a mature medium, and California artists and printers are leaders in the fine arts of the book,” Trujillo added. The exhibition will present works by Foolscap Press (Peggy Gotthold and Lawrence G. Van Velzer) Moving Parts Press (Felicia Rice); Ninja Press (Carolee Campbell); Peter Koch Printers (Peter Rutledge Koch); and Turkey Press (Harry and Sandra Reese). The Cantor Arts Center is located on the Stanford campus, off Palm Drive at Museum Way. For more information, call 650-723-4177, or go to the museum web site.